The Sacramento Bee has a database set up that tells how much the state is taking from various cities and counties to help with the budget fiasco. Doesn't look that bad for us up here, depending on how you look at it. The money they're taking from Eureka and Humboldt County equals around $36.00 per resident. If asked for a login for the SacBee web site you can always use humboldtlib as a username and blogspot for a password. Congressman Ron Paul's son, Rand, is mulling a run for U.S. Senate. If you want to encourage him, sign on as a supporter on his web site, suggests his father. Senator Jim Bunning, the incumbent, has said he's not seeking reelection. Not sure who else might be looking at running for the seat and wouldn't surprise me if the Republicans try to fill the seat with a more statist candidate as they usually do. Still, this might be interesting so I'll try and follow this one. Here's a test that supposedly tells you what your "driver personality" is. I rated as a "Dilligent Driver". Those of you that rate as a "Couragous Commuter", please stay away from me. I guess I'm not the only one who sees the federal stimulus money being used to hire two more police officers for Eureka as not necessarily a good thing. I have to wonder what we'll be hearing when that money runs out and the city has to take over paying for those officer's pay, benefits and pensions? Well, maybe the feds can print some more money in a couple years and give it to Eureka to keep paying those two cops? The Sacramento Bee has a map that shows where stimulus money is being used and a list of projects. Looks to me like mostly government spending on the usual stuff so I'm not impressed. The Los Angeles Times tells us water demand in Los Angeles has reached a 32 year low due to new water restrictions in place there. I don't know that demand is the right word to use in this situation, is it? Maybe water use per household is at a 32 year low? After all, if they have to restrict water use then the demand for it is still there. But, that's a good thing, except I don't understand their lawn irrigation restrictions. Sprinklers are only allowed to be used for 15 minutes, 2 days a week. I don't know much about the requirements of warm season grasses that make up the bulk of lawns in Southern California, but I can't imagine a half hours worth of water a week would be enough to keep lawns green. Nor would the 45 minutes also proposed. I know cool season grasses up here need at least an inch of water a week to stay green and growing. I'm sure it's the same down there. If they're going to restrict watering to a half hour to 45 minutes a week, they might as well just restrict lawn watering altogether since any water used is being wasted since it's not accomplishing its purpose. The same goes up here. It takes hours to put an inch of water on a lawn, depending on the flow of your irrigation system. If you just run your sprinklers a half hour a week and the lawn stays brown and dormant, why keep wasting water? Just wait until the rains come for your lawn to green again. For those of you keep- up- with- the- Joneses types that want the greenest lawn in the neighborhood, the way to figure out how long it takes to put an inch of water on your lawn: Get some coffee cans or other straight sided containers. Place them randomly around your lawn to get a good average measurement. Turn on the sprinklers and see how long it takes all of them to get an inch of water. That's the minimum you should be watering and it's best to water once a week since deep watering encourages deep root growth. As far as the time of day: I see both Sacramento and Los Angeles don't allow watering during the heat of day, which is good. But the best time is probably at night as there's less wind and less evaporation at night. Just make sure to turn the sprinklers on during the day every now and then to make sure they're working right. You don't want to be like the fellow up the street a few years ago who was missing a sprinkler head and the water was running straight into the gutter. Don't know how many gallons he wasted until he took care of the problem. I was surprised to see this Associated Press story on the Porcupine Freedom Festival in the Times- Standard this morning. Pretty fair coverage of the event, I'd say. Not what I would of expected from AP. Believe it or not, I'm actually sympathetic to this idea. I think there is a lot of pressure on our fisheries, but it's hard to say how much. I'm with Ronnie Pellegrini. We really need to take a close look at this before we close off any of our coastline. I can't help but think that with modern fishing methods- heck, even in sportfishing- there's a chance rockfish and other sea life populations could get, or are, being depleted. Problem is, the environmentalists don't have much credibility with me. Fish populations tend to go in cycles, but environmentalists tend to see a low cycle in populations as proof we're killing off all the fish. Then people get hysterical, can't think straight and might overreact to a problem, be it real or imagined. I could just see them doing the same thing to our coastal fisheries as they've done to the timber industry and nobody will be fishing off the California coast. I don't think I'm being extreme in my thinking, either. After all, we live in a country where the powers- that- be recently banned the taking of krill, along the entire West Coast. Never mind they're not commercially fished in our waters and no shortage of them exists. I suspect some of the players in that ban are the same ones working on this Marine Protection Act. We do need to watch out for our fisheries, but I can't help wonder if these marine sanctuaries will eventually put the oceans off limits to us all? President Obama's Drug Czar, Gil Kerlikowske, has stated marijuana has no medicinal value, according to the Fresno Bee. This contradicts the opinions of other organizations that feel it does. I suppose this should come as no surprise since Obama has made some real goofy picks for his cabinet, but it does surprise me. I was just thinking the other day how nutty his choices for cabinet positions were- most of them, anyway. Then I remembered some of the drug reform groups- the Drug Policy Alliance being one- were hopeful that Obama's choice for drug czar might be supportive of drug law reform. I figured I should give credit where credit is due and point out Kerlikowske as one that might be a good choice. I guess not. Looking at the Wikipedia entry on Kerlikowske, one has to wonder why anyone would pick him for any cabinet position? Radley Balko, over at The Agitator blog, asks a Lefty (from her response, I consider her an Authoritarian) what the maximum size of government is that she would find acceptable. A pertinent question for times such as these when we have so many on the Left crying for more taxes. Citizen Jane, the Authoritarian blogger who tries to answer the question, doesn't answer it. She just replies that we should place our faith in government and its bureaucrats because they know what is best for us. So, lets see what readers of this blog think of government in our country today. Do we have too much, or not enough? Addendum: Radley Balko pointed me to this blog that has a more reasoned answer from a progressive/ lefty point of view. Nicely written, I thought. How much government do you think this state and country has right now? I've suggested here and elsewhere that we need to repeal Prop 98 and all the other automatic spending increase formulas that have tied the state legislator's hands during budget negotiations. Bruce Maiman wrote a pretty nice piece in the Sacramento Bee proposing the repeal of Prop 98. I wish I could of made the point that well. Speaking of the state budget, most of you have probablyl heard by now that some sort of budget deal has been made. I'm already hearing different numbers thrown around, but the Los Angeles Times lists some of the supposed cuts and revenue shuffles. I'm curious if the cut numbers are actual cuts, or just not increasing spending as much as some might have wanted? The Sacramento Bee's, Dan Walters, sees this budget agreement as pretty much the same old fiscal smoke and mirrors that they've done before. We're not over his budget fiasco yet. A rather ominous reading in the Times- Standard yesterday suggests we need more regulation of groundwater. That might be true, but I'm not so sure it's as entirely unregulated as the editorial suggests. I know just last week I was reminded by a customer that many homes in our neighborhood have wells. Or at least had them at one time, anyway. We have one in our back yard that used to have an electric pump attached to it. My customer has one of those old manual pumps over her well and she says it still works. She told me you can use your well water but said something about having to get permission from, or report to, the city if you do. Anyone know anything about that? Besides, how would anyone know if I started pumping water from my well again? Not that I'm going to try and steal groundwater. I'm just wonder how they would know? On a more upbeat note, the Los Angeles Times reports on efforts being made in Southern California to make the region more self sufficient in water. Neat ideas being thought of and taking place, but they do cost money. I especially like their attempts at rainwater storage. They point out that in the winter of 2004- 2005, enough water went into the Pacific Ocean from the Los Angeles River to supply the city for more than a year. I don't know about drought conditions now but, seems to me, we usually get enough rain in the state for our needs, we just don't have enough places to store it. I'd all but forgotten about the Oscar Mayer Wienermobile until Radley Balko posted news about it crashing into a house in Wisconsin. For some reason I was disappointed to learn Oscar Mayer has 6 wienermobiles. I always figured there was just one, silly me. I actually saw one with that supposed "Little Oscar" guy decades ago down in Southern California. I don't remember where exactly. I was real young. It was in some parking lot somewhere and the little guy that used to drive it and be on the TV ads waved at me. I guess the company still uses those things and gives drivers special training and education on hot dogs. 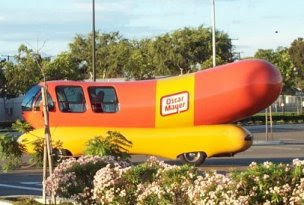 More on wienermobiles here. They have changed through the years. Boxer, or the Black Guy? This You Tube video of Barbara Boxer has been making its rounds in the blogosphere this morning. Most of the comments I've seen say Boxer is being condescending toward the black gu. I suppose she could seem a bit condescending, but I kind of think the black guy blows things out of proportion- more than he should of given the situation. Anyone interested in joining the Wyndham Rewards program? I've mentioned these folks before. You earn points with them by overnight stays at affiliated hotels, motels and inns around the country. Once you build up enough points, you can redeem those points for free stays, or merchandise. The reason I'm posting this is they're having a drawing for free nights plus a Grand Prize of one million Wyndham Rewards points (I believe a stay at the Day's Inn costs 8000 or 9000 points). If I won that one, I don't think I'd ever have to pay for a night at the Novato Day's Inn again in my lifetime! Not that I'm expecting to win but, for everyone that joins Wyndham Rewards using this link, I get an extra entry. Same goes for you if you join. Wyndham Rewards doesn't cost you anything and they only send you an e- mail or snail mail every 3 or 4 months letting you know of your point totals and any special deals they're offering. So, nothing to lose but you might get a free stay at a hotel somewhere if you stay at affiliate hotels. They'll send you offers, for example, of double points if you book a room through them during a particular time period. Problem is, the time I tried the offer, I found out later I could of booked the room for $15.00 less if I'd booked it directly through Day's Inn. Not sure the extra points would of been worth the $15.00. I'd still have gotten the regular points if I'd just booked my room directly as I usually do. Also, you have to check and make sure your points get credited to you. When I booked that one time through the Rewards program, not only did I pay more for the room, they didn't give me the double points. I don't remember if I got on their case about that but I read somewhere that if you call them up you can get your points back. I got the impression that happens fairly often with them. So, nothing to lose by joining even if you don't travel all that much, but you can start earning points as soon as you do and if you use this link, I get another entry and you get your first entry. Maybe one of us will be the big winner of a million Wyndham Rewards points! That would be a good win. Oh, and I almost forgot to mention that I think we finally have enough points for a free room at Day's Inn, Novato, now. I'll let you know how it goes. Won't reserve the room until later. Just thought I'd mention this for my fellow Monkees fans. Peter Tork, one of my favorites in the band, had a commentary published in the Santa Rosa Press- Democrat today. It has to do with Michael Jackson but, unfortunately, I'm not quite sure what he's trying to say. Addendum: Just found this interview with Mickey Dolenz. Most notable is him saying that Peter Tork has some rare form of tongue cancer. If anyone else can find out something about this, let us know. Just noticed, in an ad from the Times- Standard, that Humboldt's best pizza place- Big Louie's Pizzeria in Eureka- has a web site. Simple, and kind of rough on my eyes, it even tells how Big Louie's got started. Some of the links on the different pages don't work right, though. A number of papers, including our very own Times- Standard, either featured or commented on this Associated Press story this morning on migration in California. It was featured on page A2 of today's Times- Standard. Calbuzz commented on it, as did one of the Santa Rosa Press- Democrat pundits. The gist of the story and commentary seems to be that, since more poor people are leaving California than rich people, it's a myth that the rich aren't really unhappy with either California or its high income taxes. What I think they're missing is that there are still more people- rich and poor- leaving California than staying here and even poor people pay some taxes. Addendum: As an aside, the Calbuzz comments function seems to be a little off. At the bottom of the article it shows that there aren't any comments on the article. When I log in, I see mine there. Strawberries, vegies, herbs and much more. I've been getting a little tired of all the finger pointing at our state legislators for the budget situation. Sure, they did their fair share of the damage but, as I've written before, the electorate not only voted these legislators in to office (multiple times), they also voted for many of the bond measures and spending dictates that created problems the legislature can't seem to work around. The Oakland Tribune pretty much lets me rest my case that the people of this state are just as much of the problem as those in government. According to a recent poll taken, 7 out of 10 California voters approve of the idea of increasing cigarette taxes as a way of closing the budget deficit. Of course, this poll was commissioned by the American Cancer Society so it might have been a push- poll, but I still think the point has been made. 7 out of 10 people in this state think it makes sense to rely on a tax that, by its very nature, will be a declining source of revenue. We are doomed. At least the Republicans in the state legislature see the foolishness in that. Cell Phones While Driving Decreasing? The auto club checked 13,500 vehicles along seven roads in Orange County and found that 9.3 percent of those drivers were using handheld phones before the law went into effect last summer. That figure declined to 3.3 percent last July before rising to 3.9 percent this spring. I guess it's time for me to do my own survey that I said I was going to do some time ago. It seemed to me cell phone use went down a little right after the law was passed but my non- scientific personal observations of late tell me that drivers are using cell phones as much or more than they were before the law passed. I watched cars driving out in front of my house for a few minutes last week. I actually didn't count the exact number of cars because I wasn't planning on it, but I guessed later that maybe ten cars passed by. Of those ten or so cars, 3 drivers were definitely talking on their cell phones. That's 30%- much higher than the Orange County study showed. Sure, that was just a quick observation for a short period of time and in no way scientific, but I'd say I see close to the same numbers as I'm driving around town. I need to actually do this right and count the cars and drivers using phones for an hour, or so. I'll try to do it this week. If you see me sitting in my front yard, clipboard in hand, that's what I'll be doing. EDITOR: The state of California is in dire need of money, and the response is to raise taxes, cut services and funding for schools, close parks, etc. We license boats, motorcycles, sportsmen, dogs and more. Bikes should be licensed and registered annually. Cyclists should learn the rules of the road and take driving tests. Licensing and registration should include information as required for vehicles. In the 1940s, when you purchased a bike, a license was required with a small fee. Why did this stop? There are reports that some bicyclists have abused pedestrians and bridge workers. Why not charge them a toll to cross our bridges? Speeding, ignoring arterials and signals and blocking roads with demonstrations are common practices. Road improvements, bike lanes and paths are being added for their safety. License and registration fees on cyclists could offset these expenses. More bikers are commuting to work and should bear the burden of road improvements. I believe everyone who uses our roads, highways and bridges should pay their share. The state is in financial crisis and needs revenue. Here is an opportunity to assist all counties and increase revenues. And people wonder why I don't celebrate the 4th of July. If you haven't met our very own Jennifer "Jen- Jen" Savage yet, she'll be doing her DJ duty at the Eureka Old Town 4 July Festival on Saturday. KSLG radio will be broad casting live from the corner of 2nd and C streets from 10am to 4pm as part of a fund- raising drive for Betty Chin and the St. Vincent DePaul Society. The news article says they'll be right next to some stage where music will be playing. They make it sound like that's a good spot but, back when we used to do Libertarian Party tables at the Old Town 4 July Fest, they put us next to a stage the first time and it was a real pain because you couldn't hear what people would be saying to you while the music was playing. We asked to be placed further away from the music after that. J.D. 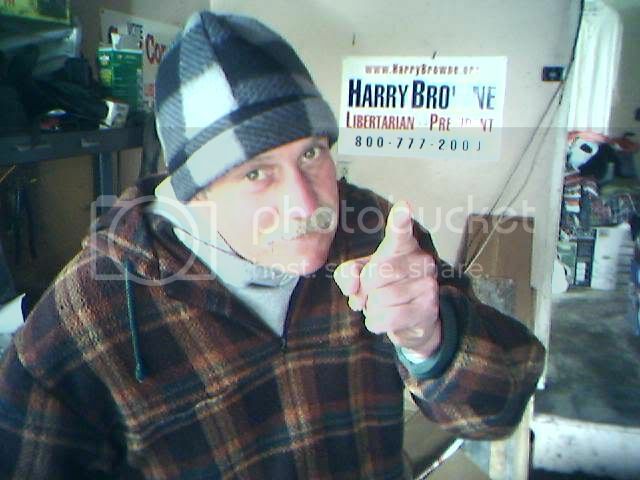 Tuccille, over at the Disloyal Opposition blog, compares conservatives and progressives. So true.